About 15-16 yrs ago I purchased the Epic 60 / 350 HT system. Wonderful, wonderful. We finished our basement last summer and they now reside in a theater-type room. I had to replace the amp in the sub (EP350) around that time. We've been using the room and running the volume the same as before (I think). Recently I have noticed some loud popping coming from the sub - mostly during very intense, deep LFEs. We just watched Iron Man and it happened when he demonstrates the Jericho missiles at the beginning of the film and a few times after. Yesterday I watched the opening 20 minutes of Saving Private Ryan - volume at same level - did not experience the pops. 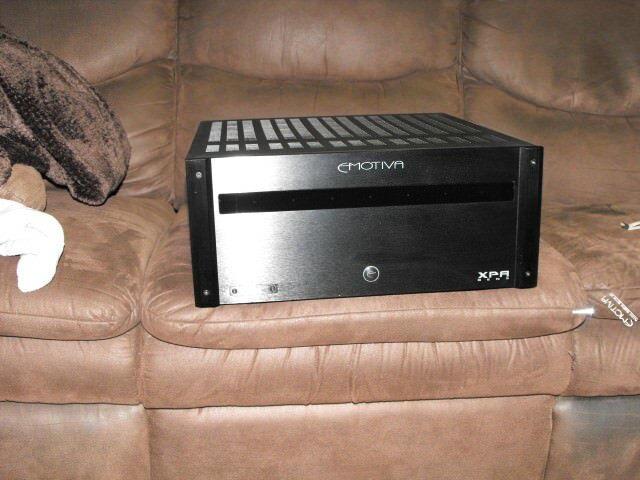 I'm wondering if the amp is more powerful that the original amp that shipped with the EP350 around 2000-2001 OR if I just need to back the sub volume down a little OR if I could keep everything the same and replace the old woofer with the latest in the EP350 series. Your over driving the sub. if you in a bigger room than you were before you are probly trying to acheive the same level as you were accustomed to before . It sounds like the driver is moving out of the voice coil. It also may just be worn out, getting a bit long in the tooth. Time for an upgrade. Thank you for the reply - that was my assumption. I'm trying to relocate the sub and have turned it down a little and that has helped. Do you think it would be worth ordering a new driver to replace the old one? Then I'd have the latest version amp and driver. I'm pretty sure the amp is more powerful than it was 15 years ago so it's a good question. I'm not sure but it appears Axiom has gone back to something more like the v2 cabinet for EP350 but probably kept the improved speaker that the v3 shared with EP500. If those two are both true (newer/better speaker AND current cabinet is close enough to yours that tuning etc.. will still work) then it seems like it could be a great idea. I just don't know if either of those are true, let alone both... probably only the Axiom folks would know for sure. Here is my honest opinion. There is no situation where 1 sub is better than 2 , so put that one in the closet or another smaller room and get 2 new subs . Technology march's on and i can tell you that you are missing out by not upgrading . If it just isnt in the budget then do the subcrawl to find the best location and reduce the sub output for movies that have lots of explosions. Did you recalibrate the new sub? the gain attenuation on the new amp isn't necessarily the same as the old one, hence over driving. Yes, I did recalibrate the sub, but this room is much larger than the original room - 20x16x9 - and has a 7' opening with barn doors on one side. The more I think about it, the more I think Socketman is right - an additional sub is going to get me back to the levels I remember in the smaller room over just replacing the driver. Even with the sub backed off a little - it's actually where it should be w/re to blending and music, it's just not a bass-head level during stoopid movie scenes. Yet, after 15 years, these speakers still make me happy and they fill room effortlessly - especially the M60s. Yep... while I think Axiom's ongoing improvements are essential for "pure music" listening I am every bit as happy with my M60ti's for HT use as I was when I first got them. I replaced the VP100 with a VP180 but otherwise the only change I have planned is flashing my AVR to support 7.1 and hooking up a pair of M2ti's in the back. I have an opportunity to purchase an EP 350 V4 .I was wondering is it needed if I purchase M100S. Or should I go with sub and M80S . I have never heard the 100's but if you want to mine the lowest octaves subs are great to have. Also if you cross over your mains so the subs handle the lower power hungry notes it takes a large load off the amp/receiver . I use a pair of 10's and hope to add some more as money allows, i am a bassaholic lol.